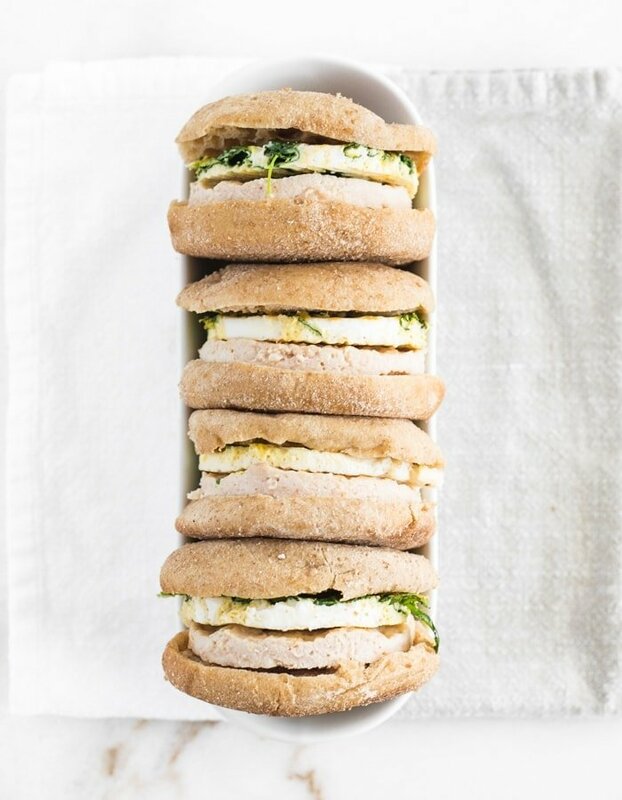 These healthy meal prep breakfast sandwiches with spinach, eggs, turkey sausage and whole grain English muffins are the perfect quick, easy and nutritious breakfast to fuel your busy mornings! Getting out the door in the morning can be rough some days. But you definitely need breakfast before you go to make sure you’re fueled to get through the morning, right? I absolutely cannot skip breakfast, or I will be hungry, moody and distracted all morning. That’s why I love these healthy meal prep breakfast sandwiches. Overnight oats and chia pudding are great breakfasts that you can prep ahead for busy mornings, but some days you want something hot and savory. 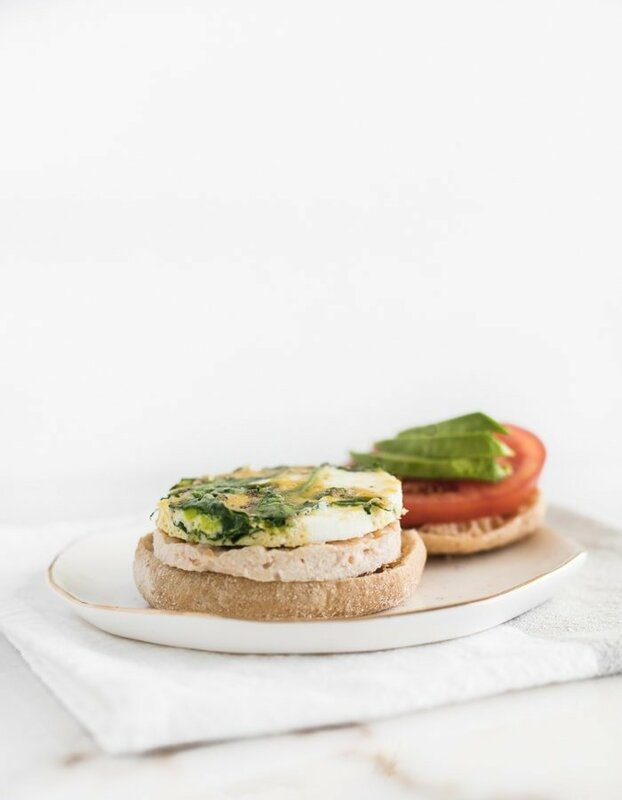 I love starting my day with eggs and vegetables, and these meal prep breakfast sandwiches make it possible to incorporate them into a quick and healthy breakfast. I’m not usually a big meal prep person, but I’ve been doing more of it lately at the request of Mr. Table. I like to give myself plenty of flexibility to eat whatever I feel like without feeling like I’m wasting whatever I already prepped. 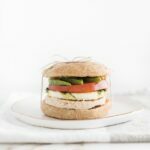 This recipe makes enough for 6 sandwiches – the perfect amount for us to have enough during the week, while still allowing us flexibility to decide on something different to eat if we have a little more time in the morning. 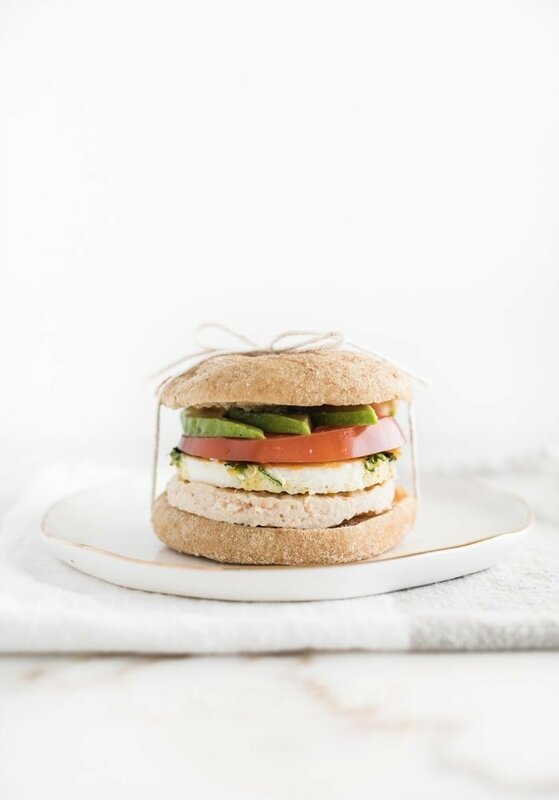 Mr. Table loves being able to put together these sandwiches for breakfast in just a few minutes, and they keep both of us full and satisfied for hours. I love that we can customize them how we both like in the morning, too. I usually leave off the sausage and add avocado and tons of veggies, while Mr. Table likes classic sausage, egg and cheese with a slice of tomato if there’s already one cut up. This recipe is super flexible to suit your needs. They can easily be made dairy-free by leaving off the cheese or gluten-free with gluten-free English muffins. You can add extra greens, leave out the meat, or add in whatever you like. Make them with whatever makes the most sense for you! Can these meal prep breakfast sandwiches be frozen? You can assemble and freeze these breakfast sandwiches to pull out of the freezer and eat anytime! To freeze, just assemble the sandwiches (without tomato or other toppings) and tightly wrap them individually in plastic wrap. Once frozen, you can add the all to a large bag. You can thaw as many sandwiches as you need in the refrigerator overnight or just take them out and heat from frozen as needed. To reheat a breakfast sandwich, remove plastic wrap and wrap in a damp paper towel. Heat thawed sandwiches for 1 minute in the microwave, or frozen sandwiches for 1 1/2 -2 minutes. Any other toppings of choice: avocado slices, spinach, tomato slices, etc. Heat oven to 350°F. Line two square 8-inch baking dishes with parchment. Spray with oil. Lightly coat a nonstick skillet with oil spray. Add garlic and cook over low heat, stirring, until fragrant. Add spinach or other greens and cook until wilted. Spread greens evenly in the bottom of one of the baking dishes. Pour eggs over the top of greens and sprinkle with salt and pepper. Press sausage evenly into the bottom of the other baking dish. Bake eggs and sausage 15-20 minutes or until set. Remove from oven and let cool before handling. Use parchment to lift eggs and sausage out of the pans. Cut each into 6 pieces and store in separate containers in the refrigerator until ready to use. You can use a small biscuit cutter to make eggs and sausage round, if you’d like. To assemble, cut an English muffin in half and toast. Heat an egg and sausage piece in a small skillet or in the microwave (covered). Place on the bottom of the English muffin. Top with cheese and any other toppings desired. 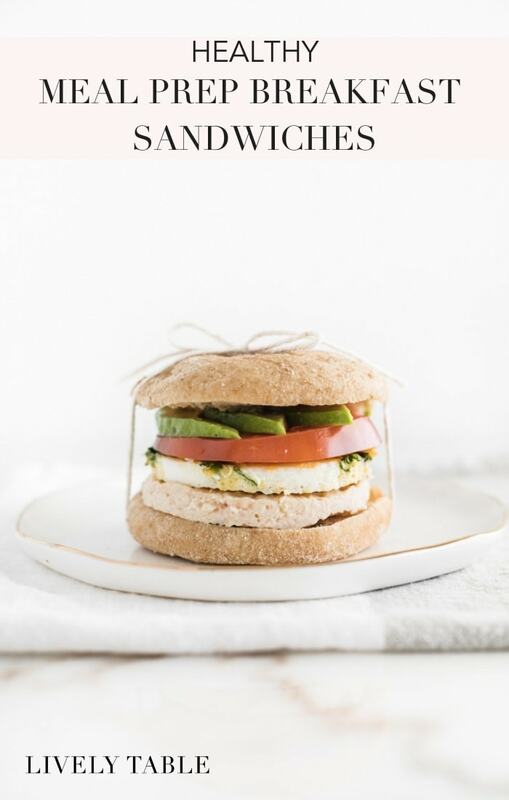 Love this healthier take on savory breakfast sandwiches! These look delicious and so easy to prep ahead. Definitely pinning to try later. Thanks Meredith! Let me know if you try them! This is a great idea! Looks super tasty! Great minds! Freezer friendly is awesome! Yours are so not inadequate! Clever idea, thanks for sharing. Thanks for stopping by Sarah. Enjoy!